Two years ago, upon moving up in the world, north that is, from the town of Ofra in Binyamin (See Judges 6:11) to K'far Tapu'ah around the border between Efraim and Menashe (See Joshua 17:7-8), I was invited to eat Shabbath dinner with HaGedud HaIvri (the Jewish Legion). The Torah-based Jewish Legion, a resurection in spirit of its name-sake founded, through the efforts of Ze'ev Jabotinsky and Yosef Trumpeldor in August, 1918, was a group of Jewish volunteers who trained in self-defense, dog-handling, emergency medical response, and other security operations. Members came from Israel and from outside of Israel; some were "frum from birth," others only learning about their heritage. It was one of the only organizations or programs in Israel which was truly made up of a diverse group of Jews, building the kind of Jewish unity so-called pluralists only "talk" about. Anyway, I was invited to join them for dinner. I could not arrive empty handed, could I? I prepared the recipe below, and brought it over. Introductions were made. I had remembered several of the members from when I first visited K'far Tapu'ah, two years previously. Still, my eyes were fixed on my salad as it was passed around the table, making a mental note of who took, and who did not. I wanted to make a good, first impression. WHEW! Most of them took, AND finished what they took. One of the members of the Gedud HaIvri, who liked this salad, asked if he could "claim" it, and put the Legion's name on it. Thus was born the "Jewish Legion Zucchini Salad" (pictured below). He soon left to go get some sleep. He had to take up his post at 2:00am. Even though exempt from service in the IDF, this Jew decided to give three years of his life in the service of his People and and his Land. So, for three years, seven days a week, from 2:00am to 8:00a, he was the only person standing between the western boundary of K'far Tapu'ah, Giv'ath Tapu'ah HaMa'aravith (Tapu'ah West Hill) and the Yishma'elite (Arab) village of Salfit, in so-called "Area A." Another member, the Number 2 man in the Legion, later went out to his guarding post, overlooking the neighboring Yishma'elite village, Yassuf. He took up his position, armed only with a cellular phone and a plastic fork, having been unceremoniously denied his right to bear arms by the powers that be. That did not deter him from his mission. Somebody had to do it. His plastic fork, by the way was more of a symbolic protest weapon, than a functional one. Although, he did seem to be pretty resourceful. Well, none of the dedication of these Jews seemed to matter to the IDF local command nor to the Israeli police, when on 8 Teveth 5766 (Jan. 8, 2006) they raided K'far Tapu'ah, confiscating everything from the dining room table and chairs to their specially trained, pedigreed Mallinois (Belgian Shepherd) guard dogs. These are the same dogs which guarded towns throughout Yehudah, Shomron, & Azza (Judea, Samaria, & Gaza), deterring Yishma'elite infiltrations. These are the same dogs which (with their handlers) assisted the IDF in searching vehicles for bombs and bomb-making materials. These are the same dogs and handlers who spent their Saturday nights guarding hitchhiking locations during the recent kidnapping scare. 1. Wash, and leave un-skinned, 10 or so medium-sized qishu'im. Slice into circles about 4 mm wide (about 1/5 in.). 2. Whether deep-frying or frying in a regular frying pan, make sure to pre-heat the oil. Otherwise, the result will be a soggy mess. 3. 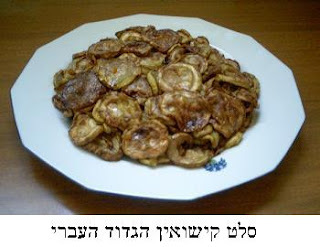 Fry until the last piece of qishu'im begins to brown. 4. Remove, and allow oil to drip, or place on ripped-open, brown paper bag or paper towels to allow the excess oil to be soaked up. Repeat with with subsequently batches. 5. After all of the qishu'im have been prepared in the above manner, place four or five cloves of garlic, finely chopped, into the frying pan, with only a little oil, if not the oil which was dripped off from the deep-fryer, and reheat briefly. 6. Once the garlic begins to fry, add the qishu'im, and turn off the fire. 7. Immediately add the soy sauce, about three tablespoons. Additional soy sauce can always be added later according to taste. 8. With a spatula, gently flip over portions of qishu'im, allowing the soy sauce and garlic to mix in, without breaking up the shape of the qishu'im. 9. Allow to cool. Refrigerate. May be served cold, at room temperature, or be reheated for an additional side dish. On that fateful day in Teveth (January) of this year, I, myself, happened to be in the wrong place at the wrong time. All of my personal belongings were searched, and personal letters read. I was then taken in, "detained for questioning." I spent a few hours at the police departments "lovely" facility in the Russian Compound, Jerusalem. During my "questioning," I was asked what my connection was to the Gedud HaIvri. I told the detective about once in a while making a salad to bring over to them for Shabbath dinner. That seemed to catch even him, a seasoned interrogator, off guard for a split second. I believe that that I was released, as he was certain that I could not possibly have made up such a thing. It's just like the Erev Rav (decendants of the"mixed multitude") police not to concern itself with the power of misswoth (Toraah commandments) like Shabbath and Hakhnasath Orhim (welcoming and providing for guests). Kosher Cooking Blog Carnival #9! A good spoken word always have more power over arrogance.